It was a low scoring affair in Division 2, but Newport Pagnell did enough to see off leaders Westcroft. Sam Chapman and Paul Beckett took three wickets each as Westcroft were skittled for just 103, before Lewis Heffernon hit an undefeated 58 as Newport (104-4) cruised to victory. 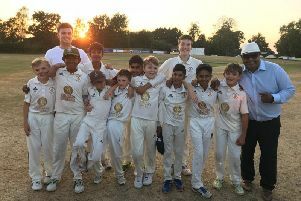 Aspley Guise took over in second spot in Division 2 with a 20-run win over Harlington. Ben Savage top scored on 57 as Aspley Guise scored 232-8 before Robert Harrison took 4-45 as Harlington were bowled out for 212. A sensational batting performance from Olney saw them demolish Eggington Foresters. Jeremiah Shields (175 not out) and Peter Young (108 not out) saw Olney declare on 314-0 before tearing through Foresters, bowling them out for just 83. Kunal Acharya took 6-51 as North Crawley 2nds (143-3) beat Open University (140). Milton Keynes moved to the top of Four Counties Division 1 with a 102 run win over reigning champions Eaton Bray. After a huge first innings, MK set 297-4 for Eaton Bray to chase, but it was always going to come up short, with the visitors toppled for 195. It meant MK took over the top spot from Thurleigh, who could only draw with New City. Manjit Singh’s sensational 5-8 made sure Thurleigh were restricted to 253-9. New City (181-6) couldn’t reach the total and the draw saw Thurleigh drop to second. North Crawley (307-1) returned to form with the bat, but couldn’t beat Biddenham. Centuries for Matt Goss (136 not out ) and Dean Adam (120) put Crawley in good shape, but Biddenham (204-8) dug in to draw. MK City (213-7) beat Elstow (209-7) and New Bradwell (118-1) beat Printers (117).